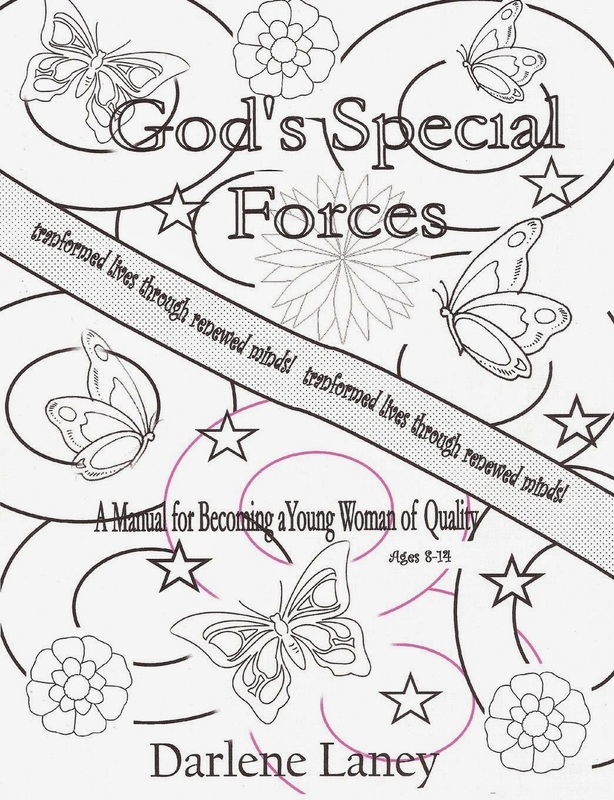 God's Special Forces-A Manual for Becoming a Young Woman of Quality (Transformed Through Renewed Minds) by educator and evangelist, Darlene Laney, is a eleven part biblically-based program designed to enhance, nurture and affirm young women (ages 8-14) and mold them into the Mighty women of God that they were created to be. Enhancing self-esteem, teaching proper etiquette and developing social skills, along with teaching who they are in Christ, the author highlights how valued and precious women are to the Lord. This is where the study begins. But it doesn't stop there! Challenging the girls to "take off the old and put on the new," young women will learn to renew their minds through the Word, fostering a transformed attitude of themselves as women, and enables young girls to discover their true identity, renewed strength and purpose in the Lord. Girls that have gone through the series have learned to love who they are, understanding that beauty is not just from the outside, and fully embrace being unique, as God created only one of them to do the incredible work He has predestined for them. This is far more than a handbook on how to like yourself. This is a program that offers the truth of God's Word as a firm foundation to stand upon – transforming and renewing minds! This study comes highly recommended as a wonderful, uplifting and confidence building biblical foundation that is recommended for all young girls (ages 8-14) within any church environment. Color it, personalize it throughout, this book was created for you to design this masterpiece along with mom, friends or within a group setting that is fun, energetic and age appropriate for tweens, teens and young girls! You may get your copy of God's Special Forces at Amazon and at Barnes and Noble. Be sure to visit the author at Darlene Laney for some great ministry, lots of love, hope and encouragement.